Reference involves both the area of morphosyntax and of pragmatics. In language acquisition, children are therefore faced with a double task. Not only do they have to acquire the relevant morphosyntactic forms for reference (e.g. nouns with determiners, pronouns), but also the pragmatic conditions under which these forms can or must be used. 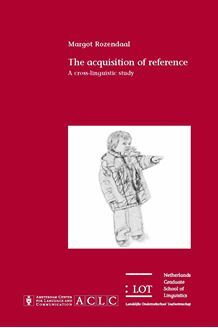 In this study, the acquisition of reference is examined on the basis of spontaneous speech data from three children acquiring Dutch, three children acquiring English and four children acquiring French. The input addressed to these children is also analyzed. The children’s use of nouns without determiners, nouns with different determiners and different types of pronouns is investigated in relation to their developing sensitivity to three pragmatic conditions: specificity of the referent, the givenness of the referent in discourse and the assumed familiarity to the listener of referents that are new to discourse. The results of this study show that children’s sensitivity to the morphosyntax­pragmatics interface in reference is related to the speed with which they acquire the relevant morphosyntactic forms. Cue frequency and cue consistency of associations between morphosyntax and pragmatics in the input also play an important role in the acquisition of reference. This study is of relevance to scholars who work in the field of language acquisition and who are interested in the acquisition of determiners and pronouns, the morphosyntax pragmatics interface, cross linguistic comparisons and the influence of the input on acquisition.